We had wanted to get him a dinosaur birthday cake but there is nowhere to buy a cake out here and as horrible as it sounds i have not had time to cook him a cake. So the poor kid got a whole lot of nothing. How embarrasingly sad! He got a new swimming rashy and a singlet and a pair of shirts from grandma and grandpa but that was his only present cos Tim and i were too lazy to buy him anything. Actually, we bought him a pair of crocs a few days ago for his birthday but he is wearing them already. 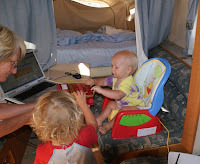 We spent close on an hour trying to get the computer set up for a web chat with Aunty Lala and finally managed to get a 5min chat before we had to finish packing to get on the road. Our mobile phones have no reception even though the computer has full signal... ?? go figure?? After being too busy playing with the kids next door Jordy decided he was ready to talk as soon as we hung up. Has to be contrary. There are a few areas around Hughenden where you can fossick for fossils and we thought it would be fun to try before we left town so we asked for directions at the tourist centre- head out of town about 16km and when the road goes from one lane to two lanes look for the dry creek bed with three gum trees in it. Found it! It was stinking bloody hot! And Darcy fell asleep in the truck on the way so we left the birthday boy in the car while we searched for 10million year old remains of sea creatures. I found one belemnite (sort of a squid body) after only a few minutes, and then some interesting pieces of glass looking quartzy stuff but then i scrambled and searched for a while with no luck. 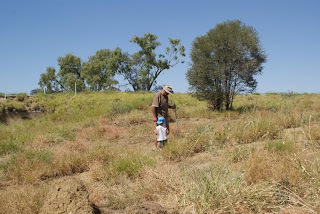 So i left Tim to that creek bed, and Jordy and i headed to another 100m down the road. I was dying in the heat and Jordy wanted me to carry him cos he was "getting puffed out". 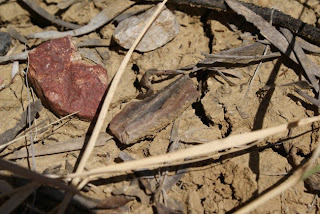 After about 10min i found a good area and found close on a dozen more belemnites, a round thing that looked somewhat fossily, and another rock that looked like a fossilised piece of bone. By that stage Jordy had had enough so we headed but to the truck. And found Tim scratching in the dirt RIGHT beside the truck pulling out whole belemnite after belemnite. He'd found a great cache right where we'd parked. LOL! Typical. He even had shade. Darcy woke then and had the shits and Jordy was hot and tired and we were hot and everyone was hungry so we turned the air con on! We usually just drive with the windows down (even though Jordy complains that his hair blows in his eyes!) but we needed to bring in the big guns this time. Made the trip to Richmond a bit tough cos we lost the window for Darcy's nap time. The boys have both been travelling beautifully once we got into a routine and they became used to the travel. But the morning stop-off stuffed things up so luckily it was only a short trip. I think about 130km...? The van park at Richmond is really nice. 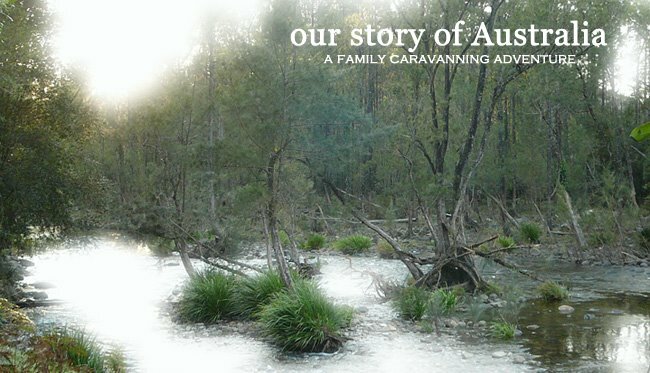 It's right on a man-made lake that has a park and a Bush Tucker Garden around it. 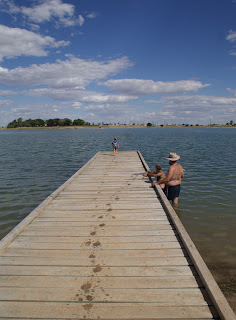 You can even fish and waterski on the lake! There are red-claw in it too apparently. So as soon as we unpacked we headed straight down for a swim. A quick change and off to Kronosaurus Korner, the local dinosaur place. 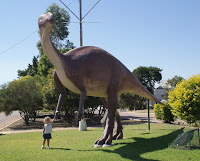 They have a great display and have found some incredible complete massive dinosaur fossils in this region. Amazing to think that this area was a huge inland sea. And the Kronosaurus make Tyranasauras Rex look like a baby dino. (ignore spelling- too tired to google to get it right!) We were rather happy that we got in for $15 for the 4 adults instead of the usual $12 per person because the air con was not working inside... It was still cooler inside than out! 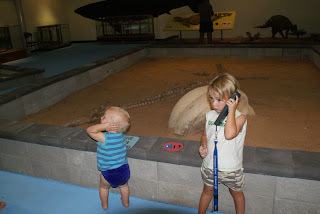 Both the boys loved the displays are the areas where you could discover a pretend fossil in the sand. I had to laugh at Darcy who walked around with his hand to his ear as if he had a talking guide as well. Showed the lady at the tourist desk my finds from Hughenden. She did not know too much about fossils but did not think my bone looking piece was really bone as apparently bone will sort of cling to your tongue a bit when you lick it! Learn something every day. Darcy was so tired from his messed up nap this morning that he crashed at 6:30. He did not even have dinner let alone give us a chance to put a candle in something. 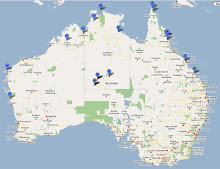 We will have to do something better for him when we get to Mt Isa. He even missed the webchat with Tim's family. Was great to talk properly with the mic this time and Jordy was excited to see them. He wants to see Bundy next time so not sure how we'll organise that. Not sure whether to stay here an extra night or not. You can do more fossil fossicking nearby and they have more variety here with shark teeth and shells etc but if it is as hot tomorrow we might not do that. 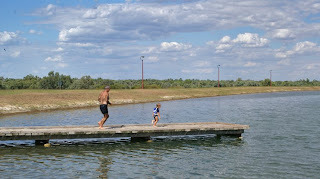 And the lake is lovely so we could swim and do the walk around the lake edge... ?? But if we move on then that gives us an extra day we could spend at Katherine NP or Darwin etc.... ?? I guess we'll decide in the morning.